Designed to neutralise the by-products responsible for bad breath. Combats body odours due to consumption of garlic, onions and alcohol as well as smoking. 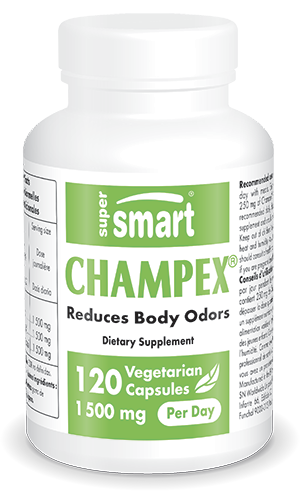 ¤ Champex® is several times more effective for bad breath than parsley seed extract. It is effective against bad breath and body odour caused by consuming garlic (93% proven efficacy), onions, fish, and alcohol and by smoking tobacco. ¤ In Japan, when supplements were administered for 30 days to incontinent hospitalized patients, their body odour and bad breath disappeared completely, and urinary and faecal odor decreased very significantly. ¤ significantly improves the activity of Natural Killer Cells, a key element of the immune system, and strengthens the immune system itself by detoxifying the toxic compounds produced in the intestines; significantly reduces the proliferation of Helicobacter pylori bacteria; stops the progression of renal insufficiency and maintains normal levels of creatinine; reduces levels of uric acid and reduces the pain associated with gout; decreases production of leucotrienes (allergenic agents implicated in asthma attacks and hayfever); is a powerful antioxidant effective against several free radicals. by your therapist. For effective cleansing, detoxification and purification of the digestive system, other dietary supplements may also be of interest. Combining a number of natural extracts, the blend Cruciferous Detox Formula, for example, is perfect for detoxifying and protecting the liver. For its part, the supplement Colon Cleanse Formula can help cleanse the colon by encouraging the elimination of waste products, food residues, bacteria and parasites. Discover too the innovative formulation Lectin Flush which facilitates the elimination of lectins, proteins implicated in certain digestive problems. Each vegetarian capsule contains 250 mg of Champex®, a patented extract of the mushroom Agaricus bisporus.